Create a killer landing page and increase your conversion rates by following this easy-to-use checklist! Landing pages are essential for successful inbound marketing; they help convert your visitors into leads and enable you to get more targeted with your marketing communications, ultimately helping you close more customers. 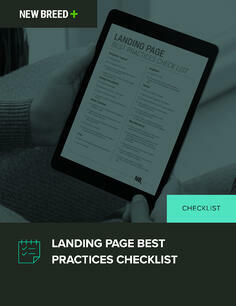 This checklist is packed with all the best practices you need to follow to create effective landing pages. To get your free checklist, fill out the form to the right!